Mental health has rightly received a significant increase in media attention in recent years. 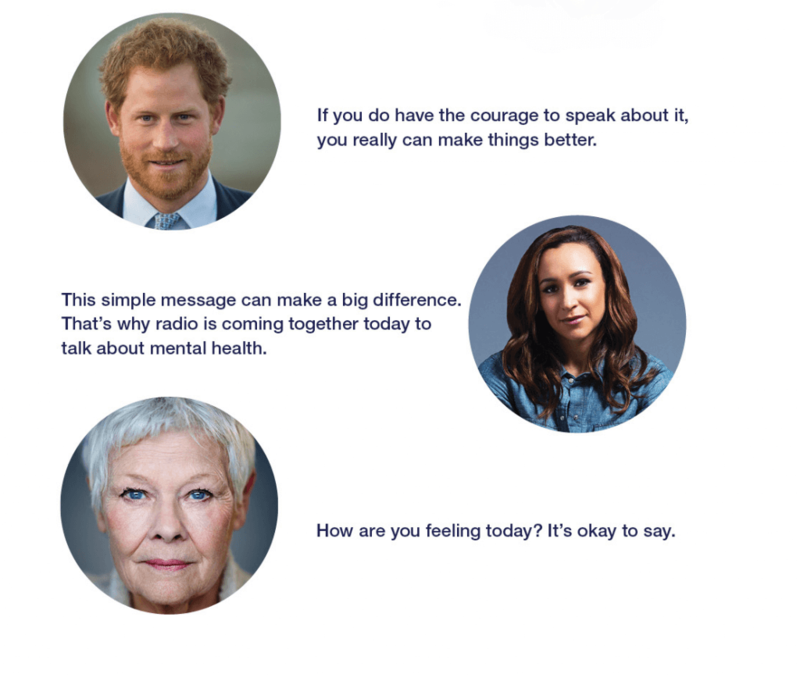 On Tuesday 15th May 2018 during Mental Health Week the radio industry – commercial radio, BBC stations and community radio – joined together in an historic first to broadcast a special one minute message on the importance of talking about mental health issues. The minute was broadcast on over 400 radio stations, reaching 20 million people. National and international press coverage of the event was extensive and tweets using #MentalHealthMinute reached over 100 million accounts. The message (below) included Their Royal Highnesses The Duke of Cambridge and The Duke of Sussex, along with Lady Gaga, Dame Judi Dench, David Harewood and Dame Jessica Ennis-Hill. At 10:59, on Tuesday 15th May 2018, for the first time in history, hundreds of radio stations across the UK came together to broadcast the #MentalHealthMinute – a one-minute message from some world famous voices to let everyone know that whoever you are, however you’re feeling and whatever you’re going through, it’s okay to say. 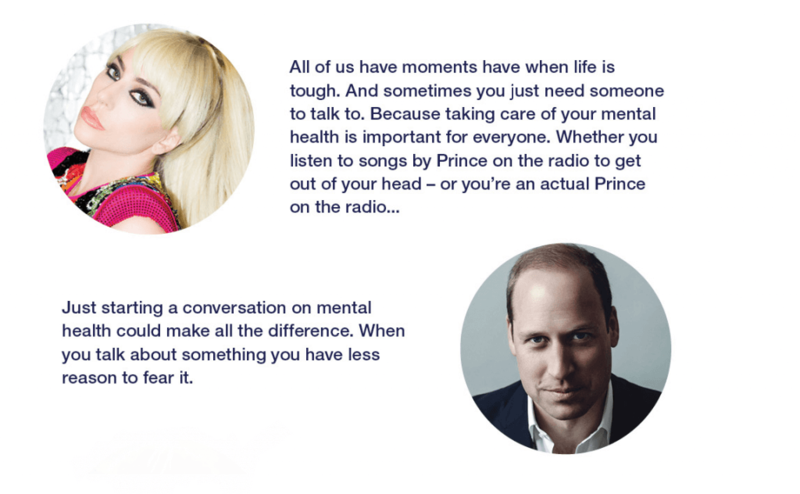 The #MentalHealthMinute fell in Mental Health Awareness Week 2018, and featured The Duke of Cambridge, Prince Harry, Lady Gaga, Dame Judi Dench, Dame Jessica Ennis-Hill & David Harewood, who all came together to take part. In an historic first, over 300 stations took part. 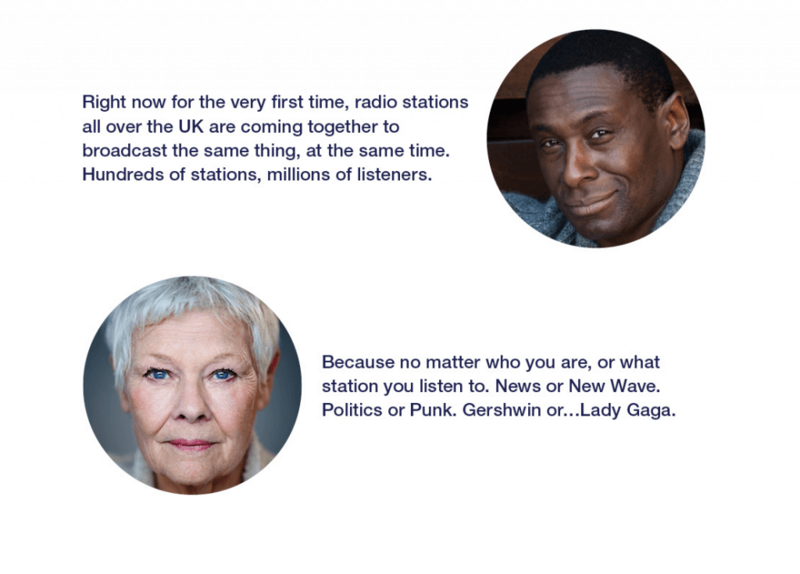 The moment united stations all over the UK from national networks such as those run by Global, Bauer or Wireless, to smaller local stations and community stations, together with BBC Radio 1, Radio 2, and Five Live. The message broadcast to one of radio’s biggest collective audiences with an average listenership of 20 million. The Mental Health Minute was led by Radiocentre and The Radio Academy, and executed by content agency Somethin’ Else. We are delighted that the moment was in support of Heads Together and our eight charity partners.